Hey loves! It has been a hot minute since I posted about my monthly beauty favorites but I’m so glad I’m back with another one. I have been trying out so much new makeup over the past month. I discovered a ton of new favorites, but also products I didn’t really like that much. That’s why I couldn’t wait any longer to share my February hits & misses with you guys! As I say in every single monthly favorites post, I just can’t believe we’re already in March. February flew by in the blink of an eye, it’s insane! My birthday is almost coming up (in April), which just blows my mind away. I remember my last birthday as if it was yesterday! Anyways, here are all the products I’ve loving / not loving for the month of February. I had been looking for a neon sign just like this one for a really long time! That’s why I’m soooo happy I finally found one, it adds such a fun girly vibe to my makeup corner, I just love it. My skin has been doing SO good recently (knock on wood), and I think it’s because I’ve been using this toner. I rarely get break-outs like I used to and my skin looks so clear! I use this toner about twice a week at night because it’s a rather harsh formula that can irritate the skin if you use it too often. But when I use it just 2 to 3 times a week, it really clears out my skin! Finally a great lip treatment at the drugstore that’s cruelty free and doesn’t contain any bad ingredients! This came out in Catrice’s Spring & Summer update and I’ve been using it ever since I tried it out in my Catrice first impressions video, it’s so good! The formula is more like a thick butter, but once you warm it up with your fingers, it’s super smooth. This primer adds a beautiful sun-kissed radiant effect to my skin that I absolutely adore! It’s the perfect makeup base for days when your skin just looks a little bit dull and tired and needs an extra boost. When I first tried out this foundation in my Fenty Beauty first impressions video, I wasn’t really blown away by it. However, the more I started using it in combination with different products, the more I started to fall in love with it. As long as I don’t use too much of this foundation, it looks beautiful on the skin with a medium coverage. If you have dry skin, you need this in your life! This spray adds a gorgeous luminous effect to the skin and does a great job of setting your makeup in place. However if you’re on the oily side, I wouldn’t necessarily recommend it as it might make you look even more oily. This is a must-have for everyone out there with dark under-eye circles like me. It’s a great peachy-toned corrector that has a brightening effect. The formula isn’t dry whatsoever and I can’t live without this product anymore. If you were wondering, I apply this after my foundation, but before my concealer. Hands down the best affordable brow gel on the market. Although it has a white tint to it, it goes on clear once you work it into your eyebrows. It adds so much ‘volume’ and thickness to my eyebrows and sets them in place perfectly. Whether you like a blinding highlight or a more subtle effect, this highlighter duo is amazing! Because it has a more intense and toned-down highlight, it’s the perfect universal highlight duo. The intense side is sooooo gorgeous, I’m obsessed. It’s a little bit on the glittery side though, so do keep that in mind if you’re not into that. I’m pretty sure this palette has become my all-time favorite eyeshadow palette. 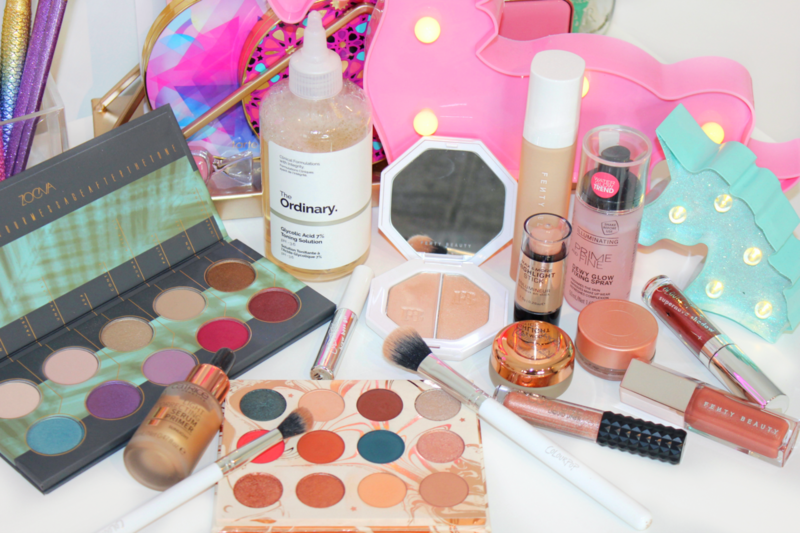 The packaging, the shades, the price, the formula,… it’s all close to perfection! If you haven’t tried out any Colourpop shadow palette, you definitely have to! I love every single one I own, but I think this is my most used palette out of all of them! This eyeshadow palette made me step out of my comfort zone a little bit, which I always appreciate! The shades remind me of unicorns and mermaids and the quality is really good. At first I was afraid this formula would be horrible, but it’s actually a really great glittery eyeliner. It dries down, stays in place throughout the day and the shade is perfection! I already picked up another shade because I love the formula so much. This is my favorite highlighting brush, ever. It packs on the color very intensely and the quality is amazing. Again, such a high quality brush for an affordable price! This brush is perfect to apply and blend eyeshadow into the crease or outer V.
The Fenty Gloss Bomb has such a beautiful formula, the color is perfection, it smells amazing AND it’s a universally flattering shade. Since I like my highlighter to pop and blind all the haters, I’m not a big fan of this subtle highlight stick. The formula is also way too dry for my liking. Even though a lot of people seem to love this liquid shadow, I can’t seem to make this formula work on my eyes. It’s sheer, dry, heavy on the eyes, it flakes,… It’s just way too much work to apply this when a liquid eyeshadow should be quick & easy. It also looks horribly flakey on my eyes. What are some of your favorite products this month? Was there anything you didn’t like?